From all your Restoration parts needs to all you Performance part wants, Boot Hill Auto can get it all. 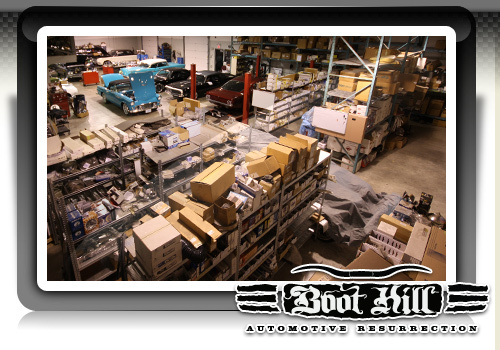 Boot Hill Auto has become the number one choice by our customers for the “all in one place” restoration and parts supplier. From custom wheels, to brakes, suspension, and billet accessories. We have the product knowledge to answer all your questions and help you build and accessorize your automotive investment. With Boot Hill Auto being direct dealers for most of the aftermarket suppliers we can pass those savings on to our customers. We can get parts for most classic muscle and all modern muscle cars and trucks. With every vehicle being so different and never having two builds the same, Boot Hill Auto strides to exceed our customers growing expectations. Fill out our online form with the items you are currently looking for and we will check with our suppliers for price and availablity then email you a quote for FREE! Check out what specials we currently have available from our parts suppiers or from our cool selection of Boot Hill Auto merchendise we have in store. We have acquired WSD (Whole Sale Distributor) status and are constantley on the look out for the most up-to-date and state-of-the-art quality products avaible to the Restoratin and Hot Rod community. Our full-time parts manager will assist in the search for those hard to find parts for your project. With over 2,000 different manufactures we can ensure you get the right part for the best price.